You'll be £12.99 closer to your next £10.00 credit when you purchase Gary and the Three Turkeys. What's this? The poem 'Gary and the Three Turkeys' was the creation of Richard Guthrie, a frustrated student at Aberdeen at the time. Bored in a lecture one day, he etched out a rough doodle of an oversized young gentlemen in a baggy sailor's suit and recalling some fanciful tale of a portly old school friend and his penchant for food and especially turkey, the creative muse was stirred and verses began to flow. The poem has since entertained many a household dining table, been the subject of insistent recital at a number of official functions and can be found, together with some of its author's own scribbled sketches, adorning many a wall from Yorkshire through to the Scottish Highlands. Entertaining all but the most Victorian of principle, it has proven a must have party piece for all ages, from those still attired in their school shorts right through to the blanket covered retirement recliners. Now the 'Gary and the Three Turkeys' has been adapted into a book and a film (featuring Brian Blessed) and a game. By purchasing the book, readers get access to all three via QR codes of web addresses. In addition the book contains 35 pieces of augmented reality which can be view after downloading a free App (also featuring Brian Blessed). 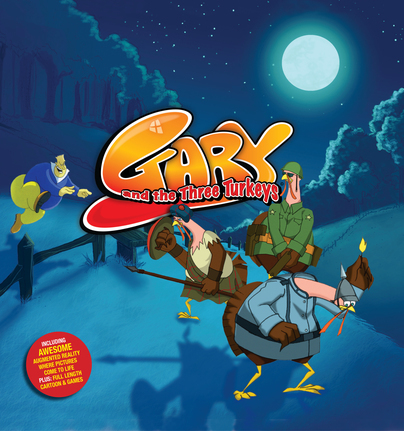 Children of all ages will love Gary and the Three Turkeys. Firstly, I have to comment on the quality of the production of Gary and the Three Turkeys. It’s a really robust, heavy-weight, hard back with super glossy pages that will withstand many many readings... Gary and the Three Turkeys is a super book. It’s enormous fun with lots of added extras that I really recommend. Very cool book for kids! As well as the story itself being hilarious, the free app you can download is awesome, which lets you see the pictures come to life almost as you're reading through! The app also lets you get onto the website where there are games and a film to go alongside the book - narrated by Brian Blessed, which is cool in itself. Played this with my young cousins and they loved it. Definitely recommended.